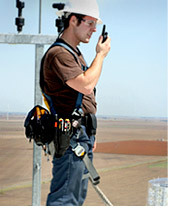 Productivity and safety merge with fall protection harnesses. Carrying the right tools in an accessible and comfortable way, keeping tools in position and easily changing out the tool array when the task changes is a productivity decision. Using the proper fall protection gear is a separate safety decision. But, Duckbill's MobilityMax successfully merges productivity and safety. Our platform is not harness-based  it's module-driven so it allows for any task, and tool mix to be used anywhere, anytime and with any positioning of the modules and tools. That's because it's all based on our patented MaxCon technology. We sync-up with a harness because of our DorsalDock and front strut technology. Duckbill¹s independently suspended MobilityMax platform transforms all Sala® ExoFit XP fall protection harnesses and all Sala® Delta® II harnesses equipped with their optional Delta® Comfort Back Pad into a comfortable, safe, flexible and multi-purpose personal productivity platform. 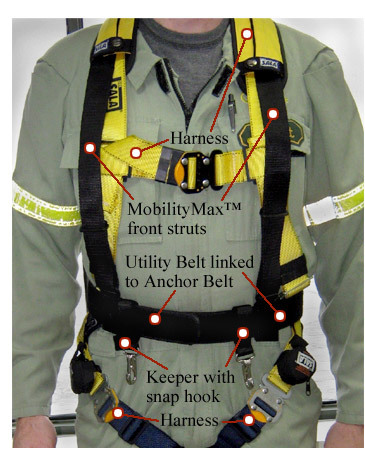 MobilityMax is integrated seamlessly onto but does not impinge, abrade or interfere with the materials, design, integrity or functionality of the safety features of the harness itself because it syncs-up with the harness at the shoulder pads and on the rear yoke with our DorsalDock. We are essentially making our Agility Platform available for use with the fall protection gear. Plus our front and rear struts provide an additional degree of suspension to the harness itself thereby aiding in the feel of the weight being carried. Additionally, modules can be worn on the front struts allowing easy access to commonly used equipment. MobilityMax behaves like part of an integrated whole  yet it remains a separate unit and therefore can work with any harness gear configuration  with or without a padded back belt  with or without side D-rings etc. The MobilityMax chassis itself consists of integrated front struts, the DorsalDock and rear struts and our MobilityMax anchor and utility belts. It is to that chassis that all of the Duckbill modules are attached utilizing our MaxCon clamshell docking technology. Since all of the modules dock onto the MobilityMax platform and not onto the fall protection harness itself, MobilityMax truly functions as a single integrated unit. Part of our chassis is a belt extender which adds the necessary circumference to our outer belt when wearing it with the harness, yet once the extender is removed, the platform can easily be worn without the harness. In addition, two belt keepers with a steel snap-hook are included. The keepers serve a dual purpose. First, when taking the harness/MobilityMax integrated system off, they aid in securing the outer belt to the inner belt when heavy gear is worn. And secondly, the snap hook offers convenient hanging of some tools. We don't make fall protection harnesses. But we do make them far more functional and empower the people who wear them to be more productive. Other companies make the tools, Duckbill makes using and carrying them easier.